Born in Warsaw on 20th April 1954. He is a Professor of Sociology with a Master’s Degree in Economics, an Academic Lecturer, and President of the Polish Sociological Association in 2005–2011. He studied at the Faculty of Economic Sciences and the Institute of Sociology of the University of Warsaw. In 1978, he earned a Master’s Degree in Economics. He completed his Doctoral Studies at the Centre for Research on Lifestyles, which is part of the Institute of Philosophy and Sociology at the Polish Academy of Sciences. In 1984, he received a Doctor’s Degree in Humanities. He also habilitated at the Institute of Philosophy and Sociology at the Polish Academy of Sciences in 1997. In 2008, he obtained the title of Professor of Humanities. Since the late 70s, he has been associated with the Institute of Philosophy and Sociology at the Polish Academy of Sciences. In 1997–2005, he headed the Centre for Civil Society. He is a Professor and Head of the Department of Sociology of Social Structures at the University of Bialystok, where he has worked since 1998. Since the 80s, he has taken an active part in the work of non-governmental organizations. For example, he was the co-founder and long-standing President of the Social Ecological Institute and co-organized the All-Polish Congresses of the Environmental Movement. He was a co-founder and long-standing member of both the Main Board of the KLON/JAWOR Association and the Audit Committee and was a member of the Academy for the Development of Philanthropy in Poland. In 2011, President Bronisław Komorowski awarded him the Officer's Cross of the Order of Polonia Restituta. He has frequently taken internships abroad, e.g. a Ford Foundation scholarship at Stanford University, and lectured at various European universities. In the 70s and 80s, he was an activist in the democratic opposition and NSZZ “Solidarność" (e.g. a member of the Intervention and Mediation Committee of Mazowsze Region). In 1997, he stood as a Freedom Union candidate for the Sejm in the framework of the Electoral Coalition of Environmental Leaders. In 1998–2000, he was a member of the Freedom Union. Since 2010, he has cooperated with the Law and Justice party. On 15 February 2014, he became Chairman of the Program Council of Law and Justice, for which he supervised in-depth studies of a team of experts on the party’s new program. He was the initiator and organizer of the Law and Justice Program Convention and the United Right “Myśląc Polska”. 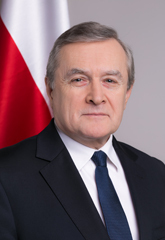 Currently, Professor Piotr Gliński is a deputy to the 8th term of the Sejm. He is married and has a daughter and son.